Adopted in 1871, the national flag of Guatemala is divided into three vertical stripes, sky blue on the outer two, and white in the middle. Guatemala’s coat of arms is centered on the white band of the flag. The national flag of Guatemala is divided into three vertical stripes. The left and right stripes are sky blue, and the middle stripe is white. Centered on the white stripe is the country's coat of arms, which was officially adopted in 1968 and includes a shield with two crossed rifles and two golden swords tied to a laurel crown. The flag of Guatemala also features the national bird, the Resplendent Quetzal. Its claws hold a scroll with the date of Central American independence from Spain, December 15, 1821. The sky blue bands on each side of the flag show Guatemala’s location between the Pacific Ocean and the Atlantic Ocean. White is the traditional color of peace, and stands for the noble virtues of honesty and harmony which are cherished in Guatemala. Sky blue and white are the colors originally used by the United Provinces of Central America. The Quetzal bird perched on the parchment stands for the autonomy and independence of Guatemala. The crossed rifles indicate the willingness to fight to defend the country against any foreign attack, the swords represent honor, and the laurel wreath symbolizes victory. As part of the Federal Republic of Central America, Guatemala used a flag with horizontal bands of blue, white, and blue again from 1825 to 1851. After 1851, the Spanish national colors, red and yellow, were incorporated into the design until 1871, when the current flag was chosen. 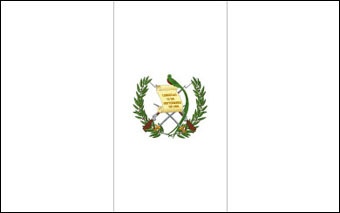 The new flag distinguished itself by using vertical stripes and adding the Guatemalan coat of arms, which was adopted in 1868. Flag Day is celebrated on August 17.